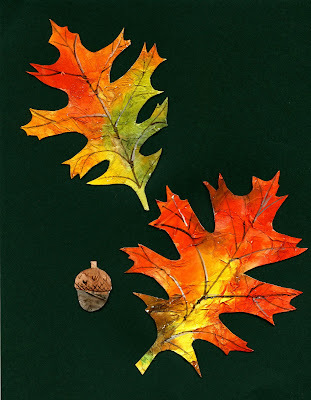 Here is a painted leaf project that is very easy to do. Sometimes when I try a new technique I try it over and over again finding lots of applications. This is based on the tissue paper texture technique I described in this post. This can easily be done with younger kids with only some assistance with the textured paper prep. Please feel free to click on the picture to see the detail in these leaves. You first need to prep the paper you will be using. Take some torn pieces of tissue, some gesso and either a paintbrush or a spreading tool like an old gift card. Spread some gesso on the paper...lay down some tissue using your fingers to create some wrinkles in it. Cover this with another coat of gesso to keep the paper down. For more detailed instructions check out my post here. Print off some leaf templates or you can freehand these. Trace the leaf shapes onto the back of the paper. Cut out. Try to use an odd number of leaves it will make for a better composition. Paint with tempera or watercolor paint. Leaves tend to turn color from the edges first. 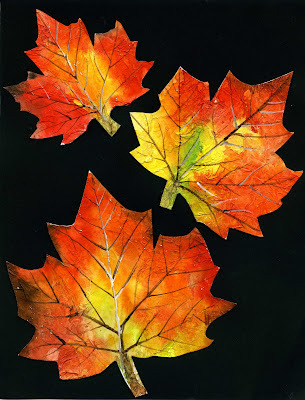 You will often find leaves that are still green in the center....discuss this with the kids before painting...you want a variety of colors on each leaf. You can also use some brown on the edges. The colors run together a bit and pick up the texture from the tissue paper. If you wish you can add some veining using some dark brown and white paint as well as a fine paint brush. With younger kids you could use pencil crayons or fine markers to make it easier. Glue down on some nice contrasting posterboard as a mount. You can now put a sheet of wax paper over your work and lay a heavy book on top to help your piece dry flat. Here is one with an oak leaf shape. Give it a try and we'll see you next time. ohhh, we'll be trying that one today! I have a "featured on" button if you like to grab those. Love the look of these and the use of brilliant, saturated colors. Really like the color of the leaves, I have done a 'thing' with leaves. Basically drawing round them then using that as the drawing to... oh just go and see the free video! Love YOur Blog--I'm a beginning art teacher and I am really digging your stuff! I'm not an art teacher or even consider myself an artist. Just work with children and we love art projects. I've never heard of "gesso". Is there a substitute for it? Gesso is a white acrylic paint primer that has chalk particles in it. When you use it as a primer, painting a surface before hand, it provides a nice fine finish with a bit of "tooth" to it to help your next layer of paint adhere to the substrate. In this project you can just use white acrylic or even liquid tempera as a subsitute. Gesso is what is used to prime canvas, it as works well on plastic and metal, which can be difficult to paint as the paint will scratch off. Hope that helps. How nice creative and easy to enjoy handcrafts. I'm a grandma who likes make things at home nice and to teach my grandchildren. Thanks and my best wishes for you from Aguascalientes. México. We made these this week and they turned out looking beautiful. Thanks for your always inspiring work and excellent step-by-step instructions. Also thanks for posting all your fall projects in a gallery that's easy to browse through. Gail, I just discovered your blog today while looking for some art activities for Remembrance Day. You rock! Your projects and tutorials are really clear and often use everyday materials we all have in our classrooms. I will be using your ideas often this year! So nice to see such a great Canadian blog!!! Thanks!! Thanks Cheryl. I appreciate it.